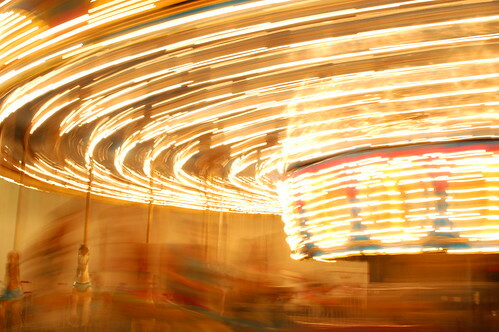 Here in Toronto, the CNE/Canadian National Exhibition/The Ex is a longtime summer tradition! Both fun and bittersweet since it’s always the last couple weeks before Labour Day, which we all (in Canada/US) know is the unofficial end of summer. After Labour Day it’s time to head back to school back to work for some, the coming of cooler weather. 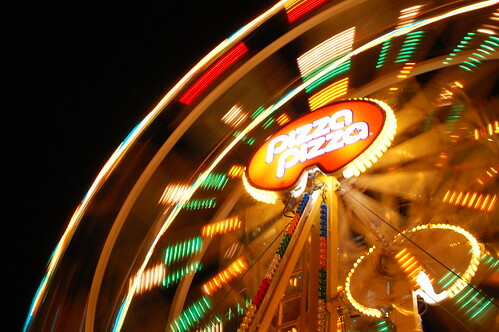 The Ex is really big, and has all sorts of different things – shows, demonstrations, shopping, food, midway rides and games. A little something for everyone. 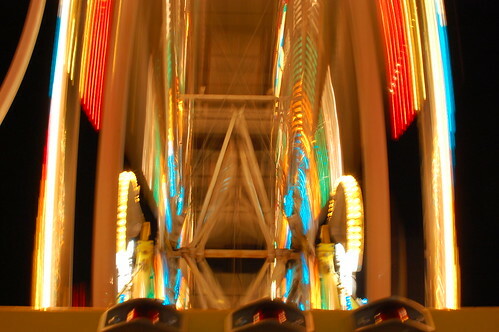 I’m not one for rides really, so I took advantage of the weeknight ‘$5 after 5pm’ thing to head to the Ex for fried food and picture taking. Hmmm, it would seem that I didn’t take any photos of food! Ah, well. Fries, pizza, spaghetti, a hot waffle ice cream sandwich and Tiny Tom mini-donuts – the only thing that was missing for my vegetarian companion and I was poutine! Lots of meat-based gravy to be had, but no veggie option. Of course we just fixed that a few days later by checking out the vegetarian poutine at Utopia on College street (and walking several km afterwards to burn it off!). It’s too good, I’m going to have to restrain myself from going there all the time! For those that don’t know, poutine is a Quebecois dish of fries topped with gravy and fresh cheese curds. 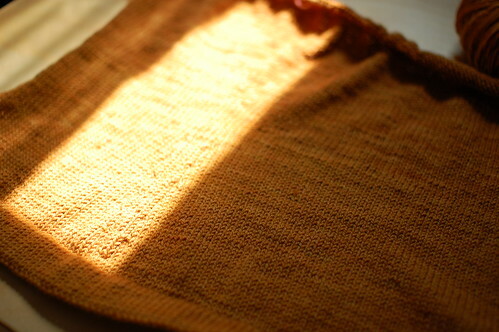 I’ve managed to put some time in on my Ginger sweater, too. Up to the armholes on both the body and the sleeves. What are you doing to celebrate these early September days? Yum! Those fries look tasty. The sweater is coming along beautifully. All those lights look so cool. I love to get poutine when we’re on vacation but there is no one who really makes it here (Well … A&W but it’s a little weird with chicken gravy). My big plans to head into fall: putting by everything left in the garden (peas, beans, tomatoes and carrots); getting a rhubarb transplant from my mum-in-law; and cleaning the house (I know spring is the traditional cleaning time but really we’re going to be spending a lot more time inside from here on). I was at a wedding yesterday, which was lovely, but my main celebration is to take advantage of a knitting daily discount and to get the yarn for your Cityscape sweater. Based on some of your other posts, you are the same bust size as me, so which size would you make yourself? I’m leaning to the 37. 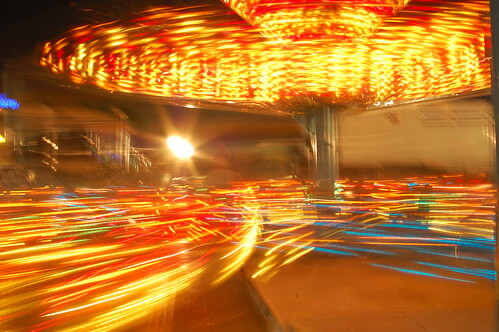 Beautiful whirling light photos! 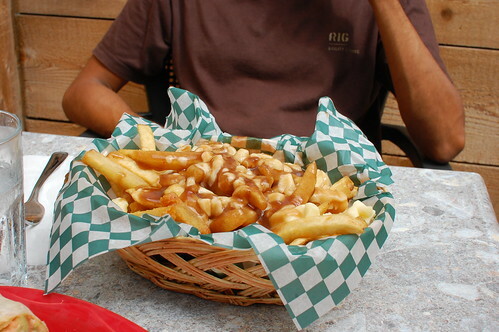 Poutine looks delicious – I think I would have difficulty restraining myself too! I am seeing in the cooler weather with the first sweater I’ve finished in almost a year (been on a bit of a shawl kick). 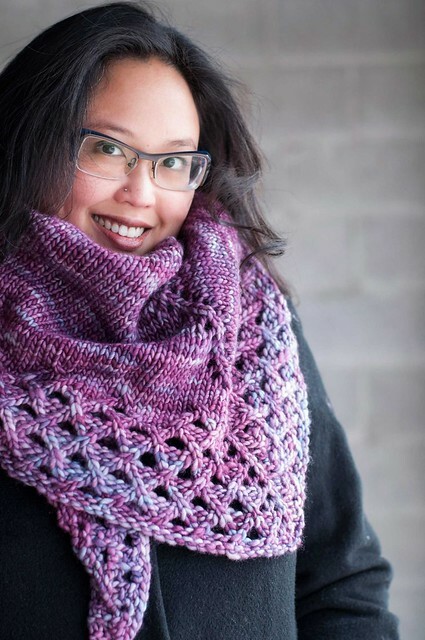 I am looking forward to keeping myself warm this with other handknits – I’m also considering your Cityscape, actually! I don’t know how I missed those light shots on flickr but they are completely awesome! Baking! It gives me an opportunity to step away from my schoolwork (classes down here start the last full week of August) and is so much better than bought bakery! I have also fallen in love with making my own granola. Can’t wait to see the new sweater!